The links between Indonesia and Charles Darwin University are strengthening with the music department’s latest project – the building on campus of an Indonesian garden. Centrepiece of the garden, to be created behind the music building, will be an Indonesian pendopo, a wooden pavilion, now under construction on the Indonesian island of Bali. The garden will eventually provide a tranquil place for contemplation, similar to the Chinese Garden, as well as offering a space for concerts and receptions. Ibu Wahyuni Saptantinah Adek, the Head of Museums, Art and Culture at the Presidential Palace in Jakarta inspected the proposed Indonesian Garden site on her visit to the Casuarina campus on Friday (March 23). 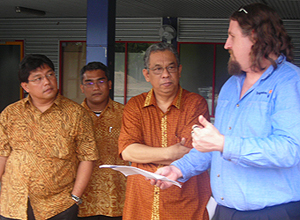 She was accompanied by the Indonesian Consul in Darwin and members of his staff. Music lecturer Rebecca Harris, who has been one of the driving forces behind the project, showed the visitors over the site, as well as visiting the Chinese Garden. ‘We are close to the first part of the garden being implemented with the pendopo being readied for arrival in Darwin next month,’ she said. ‘We have been fortunate in having Ibu Adek from Jakarta visit to inspect the garden. With her extensive experience in this area, we hope to gain valuable knowledge and cultural ideas as to what would be best to implement in the garden. CDU horticultural experts will also help to source Indonesian plants and trees to ensure authenticity in the garden.